Problem-Solving with Bee-Bot uses Bee-Bot to teach problem-solving and critical thinking skills. Through a series of sequential challenges, students learn to direct Bee-Bot on increasingly complicated routes and develop an understanding of programming, prediction, self-evaluation, and mapping in the process. Combining student motivation to use Bee-Bot with Problem-Solving with Bee-Bot structures learning and uses robot technology to support and develop vital skills for student success. Problem-Solving with Bee-Bot is available online where you may view and print the instructions, challenges, and supporting resources. A login code comes on the invoice and allows access to the curriculum for three years. Problem-Solving with Bee-Bot is targeted at students in first through fifth grades. Challenges are based on a grid which takes advantage of Bee-Bot's 90 degree turns. Initial exercises challenge students to develop simple routes for Bee-Bot and can be used with younger students. Subsequent exercises have more complicated routes tied to cartesian coordinates on the grid, providing hands-on practice in understanding graphing and mapping. Additional challenges focus on prediction, logic, sequencing, and directions. Working together on challenges helps student develop communication and collaboration skills while testing their solutions with Bee-Bot provides a motivating experience in self-evaluation. Problem-Solving with Bee-Bot includes a teacher manual with instructions and objectives, plus 150 student challenges. 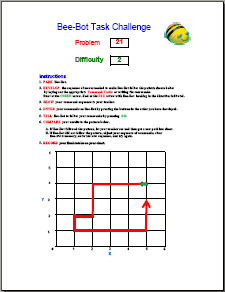 Challenges are self-contained on one page to be easily printed and distributed to students. Each challenge is self-contained with its goal and instructions. Students solve the challenge they are presented and then test their solution with Bee-Bot. Challenges are organized by type and level of difficulty, so teachers can match challenges to student experience and ability. Challenges that emphasize mapping, graphing, predicting, and sequencing are included along with a series of challenges that present increasingly complex Bee-Bot routes. Problem-Solving with Bee-Bot was developed by Lester Carr, a 40-year public school veteran, who drew on broad experience introducing technology into the classroom to develop Problem-Solving with Bee-Bot. Bee-Bot's simplicity and ease and use were an inspiration to develop challenges that put the motivation, excitement, and learning potential of robot technology into the hands of elementary school students. 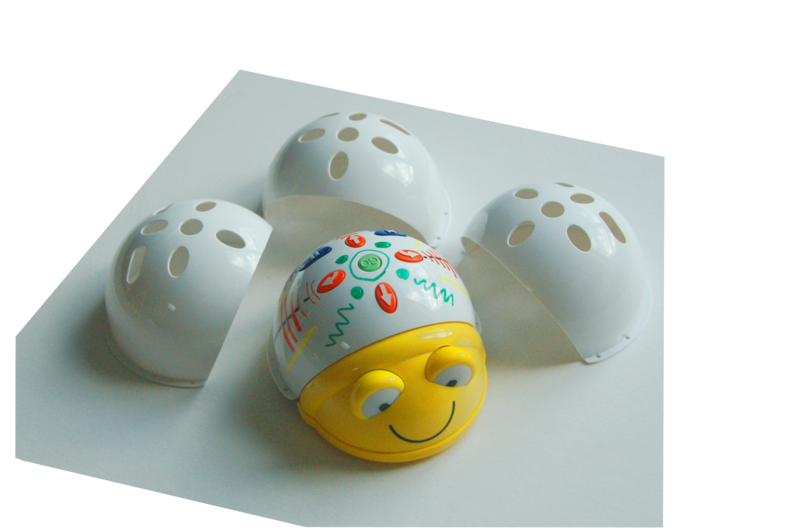 Contact Terrapin if you previously purchased Problem-Solving with Bee-Bot and would like online access. Please include as much information about your order (order number, district or school name, date, etc.) as possible to facilitate looking it up.